International comparisons of educational achievements have come to play a crucial role in understanding the educational field today. This book provides an in-depth analysis of the development of international large-scale assessments. The lives and achievements of transnational educational experts who paved the way for these assessments are discussed as well as the rise of institutions specialising in the making and managing of educational statistics such as the International Association for the Evaluation of Educational Achievements (IEA) and the Programme for International Student Assessment (PISA) supported by the Organisation for Economic Cooperation and Development (OECD). Emerging transnational policy spaces and their effect on national education policy are also problematised using the concept of ‘Europeanisation’ as a theoretical reference. By bringing together historical and contemporary comparisons using different methodological approaches the goal of this book is to contribute to a widened understanding of educational policy-making as an open-ended and complex process that cannot be reduced to a rational process of linear implementation, or a deduction of world models of education. 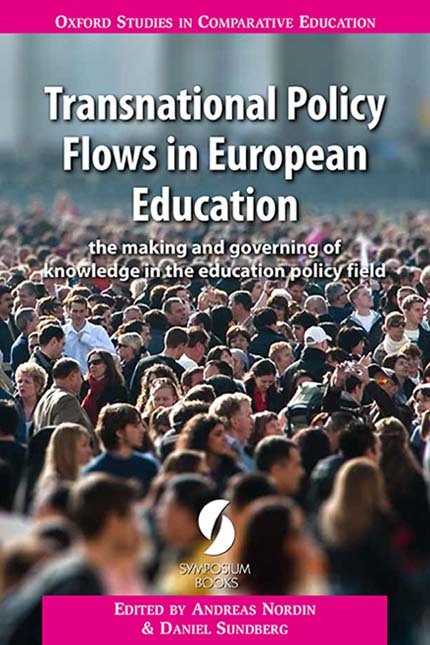 Instead the result of this book shows that transnational policy flows in many directions in European education today and is being negotiated, translated, interpreted or even contested when recontextualised in different national and/or local arenas. This book addresses crucial questions on how the landscape and its borders of educational knowledge and policy-making have changed over time and place and how the map is currently redrawn in the contemporary globalised educational context. It provides important navigational knowledge for students, teachers and researchers as well as policy-makers at different levels. International comparisons of educational achievements have come to play a crucial role in understanding the educational field today. This book provides an in-depth analysis of the development of international large-scale assessments. The life and achievements of transnational educational experts who paved the way for these assessments are discussed as well as the rise of institutions specialising in the making and managing of educational statistics, such as the International Association for the Evaluation of Educational Achievements (IEA) and the Programme for International Student Assessment (PISA) supported by the Organisation for Economic Cooperation and Development (OECD). Emerging transnational policy spaces and their effect on national education policy are also problematised using the concept of ‘Europeanisation’ as a theoretical reference. By bringing together historical and contemporary comparisons using different methodological approaches, the goal of this book is to contribute to a widened understanding of educational policy-making as an open-ended and complex process that cannot be reduced to a rational process of linear implementation, or a deduction of world models of education. Instead, the result of this book shows that transnational policy flows in many directions in European education today. It also shows that despite processes of Europeanisation in European education, the national context still plays an important role in understanding how transnational policy is being negotiated, translated, interpreted or even contested when recontextualised in different arenas. Every context has its specific historical, societal and political conditions, making legitimation possible and/or impossible. The history of fields of study, if they exist at all, act as formal guides to the ideas, methods and individuals who occupied significant positions in the field. In the case of comparative education, this is a history which appears to be dominated by American scholars and institutions, and which excludes significant actors working in the area. In this chapter, the author observes two important Nordic actors, working in comparative education in very different ways, and with different purposes, but who he places within the disciplinary field of comparative education. At local level and in international associations, actors who appear in different kinds of histories – of assessment, of progressive education, of international agency histories – undertook comparative education. In this case, Zilliacus and Husén, comparative actors in world education and international assessment, are made visible and the hidden histories of the field revealed. In this chapter the emergence of a progressive pedagogy in the first part of the twentieth century in both Europe and the United States is presented. Hilda Taba (1902 1967), an Estonian architect and educator, is the central person in the story. She arrived in the United States in the 1920s, on a scholarship from the Rockefeller Foundation. There, she was accepted for doctoral studies at Columbia University. It appears that the most influential person apart from John Dewey, during Taba’s time at Columbia, was William H. Kilpatrick. Kilpatrick developed a child-centred didactic programme, which was described as a ‘holehearted purposeful activity’. It was a method centred on the independent learning of the student, with as little teacher direction as possible. Students had to investigate and explore their environment and govern their own learning according to their individual interests. Textbooks were just one of many learning resources. Later Taba moved to Chicago and worked with Ralph Tyler in the ‘Eight-Year Study’ at the University of Chicago. She was director of the Curriculum Laboratory at University of Chicago from 1939 to 1945. In 1945, she moved to New York and became director of the Intergroup Education Project. The essence of Taba’s pedagogy can already be discerned in her early work. It was founded on three keystones: first, learning models and practice should be understood as a dynamic and interactive process; second, to foster democracy means helping pupils to solve problems and conflicts together; and third, curricula should be designed to be effective and thus be refined and developed through evaluation. Educational research has taken a long time to establish itself as academically rigorous and relevant to policy. A key development in moving it forward was the emergence of interest in international assessment in the 1960s. This was stimulated by Torsten Husén and a group of like-minded scholars from Western Europe and the USA who were concerned to shift the focus of educational inquiry from the individual student to the education system, and to do so on the basis of rigorous empirical data. This led naturally to an interest in cross-national studies. Their initiative resulted in the establishment of the International Association for the Evaluation of Educational Achievement (IEA), which Husén chaired from 1962 to 1978. IEA studies, which continue to the present as a major input to the field, were ground-breaking in their rigour, methodological sophistication, policy relevance and contribution to capacity building. Not only are they a major source of information on education systems internationally, but they have also been a major stimulus to the professionalisation of educational research. Other factors contributed to the development of educational research in the intervening decades, but the legacy of Husén and colleagues remains significant. This chapter builds on Coleman’s ‘bathtub’ model as a metaphor to understand how the Programme for International Student Assessment (PISA) articulates a sociological methodology to construct knowledge about education and learning outcomes. The model was originally developed by Robert Merton and has lately been frequently discussed in the social sciences in terms of its significance for thinking about multi-level issues. To widen the theoretical perspective, in this article the author extend the Coleman’s ‘bathtub’ model through three lenses of enquiry. First, ‘scientific bathtub’ illustrates how principles like Archimedes’ law are integrated as elements within the PISA study’s frameworks, although the main idea is to study the embodied capacities of literacy. Second, Coleman’s ‘sociological bathtub’ demonstrates how aggregated results are captured by the PISA study to explain the distribution of learning outcomes among 14- to 15-year-old students in different countries. Third, a ‘curricular bathtub’ displays how PISA’s design and work as a transnational pursuit highlights subject-matter contents, but ignores national conditions and purposes for prescribing such contents. This leads to the risk that national systems do not respond adequately to global demands by merely implementing the frameworks and findings PISA produces in their national test systems or curricula. Thus, the author suggests applying different models and knowledge fields to interpret the relevance and use of the PISA study. The International Encyclopaedia of Education (IEE), edited by Husén & Postlethwaite in 1985, had as its ambition to be the first truly international encyclopaedia of education. This meant being a comprehensive collection of all relevant educational knowledge from around the world, breaking with ethnocentrism and reaching out to educational systems in the Third World. The purpose of this chapter is to provide an understanding of the re/production of encyclopaedic knowledge of international education. Issues of representativeness in what is displayed as internationally valid knowledge and knowledge of international education are discussed. The chapter draws upon a close reading of archive material consisting of meeting protocols and editorial correspondence in the Torsten Husén personal archive at the National Archives, Sweden. The International Association for the Evaluation of Educational Achievement (IEA) was created with a view to conducting comparative studies of educational achievement and other aspects of education, and in order to understand more about the effects of educational policies and practices. As a research venture, the IEA has been able to foster the exchange of information concerning a methodology for comparison, as well as being responsible for the proliferation of data in education and the emergence of spaces for comparison and data. In this chapter the IEA is discussed as laying the foundation for large-scale assessments and conceptualising the content, methodology and language used when describing and comparing students’ results in different contexts. As such, the IEA disseminates a specific educational language that affects how education is expressed, especially educational results. This chapter reviews the recent education policy initiatives in the European Union (EU) through two lenses: (1) policy learning through the open method of coordination (OMC), as a set of mechanisms of education governance; and (2) what these mechanisms mean for the relationships between national and transnational levels of policy making. It is argued that policy learning acts as a particular mode of control of the direction, nature and content of the desired reforms, while at the same time there are appeals to its political neutrality and operational effectiveness. In the process of implementing and monitoring policy learning, national institutions become important sites for the understanding of reforms in practice. Drawing on a critical approach to policy instrumentation and new sociological institutionalism, the chapter examines key debates in the literature of Europeanisation and policy learning and how these manifest themselves in the field of education policy. The aim of this chapter is to examine the Europeanisation of the educational policy field and its effect on national policy-making, using the 2011 Swedish comprehensive school reform as an empirical case. The analysis includes official policy texts produced by the European Union (EU) and the Swedish government. In the first part of the article, Europeanisation of the educational policy field is analysed as a general process towards a strengthened coordination of national educational policies in relation to three phases. In the second part, focus is turned to the translation of these transnational policies when recontextualised into the national arena. Examining the 2011 Swedish comprehensive school reform shows that translation is a complex process leaving national politicians with the difficult task of adapting to transnational pressure while at the same time maintaining public legitimacy in the national arena. In the final conclusions this process of translation is discussed as a process taking place at different levels, and ‘horizontal’ and ‘vertical’ translation presented as a possible way to conceptualise this process. In this chapter the focus is on the changing role of the state and of citizenship education in a transnational landscape of educational policy. It is argued that a denationalised conception of education means a transformed role of the state, rather than an elimination of its influence. The analysis from the Swedish example suggests that the role of the Swedish state has been transformed from an ‘enabling’ state to an ‘influencing-liberal’ state within a field of education policy. Even when the policy discourse is shaped in international cooperation with intergovernmental organisations it is recontextualised into national curricula in specific and selective ways. In the Swedish case this means that citizenship education in the most recent curriculum can be characterised as ‘social studies taught as social science’, based on human rights. In sum, the result shows that education in the Swedish context at the beginning of the 2000s can be conceptualised as a denationalised instrumental conception of education. The Organisation for Economic Cooperation and Development (OECD) and the European Union (EU) are two of the most prominent actors to impact European education. Sweden has long been part of an international education policy discourse and transfer. In this chapter the authors focus on the educational transfer of knowledge conceptions, with three competence-related knowledge discourses disseminated from the OECD and the EU, and with Sweden as the case, that exemplify references to international competence discourses appearing in national policy and the complexity of the temporal order of borrowing and lending. They also visualise some of the curriculum displacements taking place within contemporary Swedish curriculum reforms. Conclusively, encapsulated international knowledge conceptions are transferred to national policy where they collide and intertwine with the domestic policy on knowledge conceptions, thus leading to a reshaping of the national discourse on education. In this chapter, the authors start off with some historical remarks on Swedish boundary-crossing in the field of education, before presenting a policy analysis of debate articles on assessment 1992 2011 in Dagens Nyheter (DN), a major Swedish newspaper. Their study indicates that the nation works as a key point of reference for education policy in national media, emphasising education as a means for national competitiveness and welfare. This line of argument is supported by different kinds of boundary-crossing and externalisation to outer worlds. It includes references to the international arena, to the past and to the future, and to sectors outside education. Even though globalisation has played a role in recent Swedish education policy, other components, such as reform history and the interplay with other sectors, must also be taken into account in order to explain the strong policy support for addressing the Swedish school as a national concern and entity. Nafsika Alexiadou is Professor of Educational Work at Umeå University, Sweden. Before moving to Umea in 2012 Nafsika worked for over a decade at Keele University, UK and, for a short time, at the University of Macedonia, Greece. Her main research interests and publications are in the area of international and transnational educational policy, and in the transformations of education systems under pressure from international institutions. In particular she analyses educational governance in the European Union, the relationships between the national and transnational levels of policy making, and the issues of policy learning and policy convergence. She is also involved in research on the changing nature of public education through marketisation and privatisation in Sweden and the UK, and their implications for social inclusion and social justice. She is co-author, with Colin Brock, of Education Around the World: a comparative introduction (London: Bloomsbury, 2013). Eva Forsberg is Professor in Education at Uppsala University, Sweden. Her research focuses on the interface between educational policy, practice and research from a curriculum theoretical perspective. Currently Forsberg is involved in projects on: education governance and evaluation; consequences of the growing homework support market; higher education research and doctoral education leadership; and effects of educational research reviews. Forsberg teaches courses in curriculum theory, education governance, evaluation and comparative education. She is also co-editor of the Nordic Journal of Studies in Educational Policy. Seamus Hegarty is a visiting professor at the University of Warwick. He served as Chair of IEA (International Association for the Evaluation of Educational Achievement) for eight years, from 2005 to 2012. He was Director of the National Foundation for Educational Research in England and Wales for 12 years, from 1993 to 2005. He is a member of the Learning Metrics Task Force organised by the Brookings Institution and the UNESCO Institute of Statistics; he chaired the Standards Working Group for the Task Force. He is founder editor of the European Journal of Special Needs Education, now in its 29th year, and edited Educational Research for 12 years. He has authored or co-authored more than 20 books and numerous book chapters and papers. He has evaluated and advised on research for universities and national authorities in many countries, with current or recent commitments in Chile, Finland, Ireland, Italy, the Netherlands, Norway and South Africa. Martin Lawn is an honorary professor in the School of Education, University of Edinburgh and an honorary senior research fellow in the Department of Education, University of Oxford. He works in historical sociology in the field of education, with a particular interest in the European area. He has recently completed research projects on the rise of intelligence testing, and the use of data and inspection to manage education systems. Recent books include Disciplines of Education: their role in the future of education research (with John Furlong) (London: Routledge, 2013); The Rise of Data in Education Systems: collection, visualisation and use (Comparative Histories of Education Series; Oxford: Symposium Books, 2014); and Europeanizing Education: governing a new policy space (with Sotiria Grek) (Oxford: Symposium Books, 2012). Christian Lundahl is Professor in Education at Karlstad University and Associate Professor in the Department of Education, Stockholm University. Lundahl specialises in the history of assessments, evaluation and Swedish educational research. Lundahl is presently involved in research projects concerning the production and internationalisation of data in education systems. He is also part of a project studying the effects of grading on students learning in the Swedish school system. He is a member of the Teacher Education Board at Örebro University, and he has worked as a consultant to the National Agency of Education and the National Agency for School Inspection. Lundahl teaches in teacher education, in the guidance and counselling program, and in the training programme for principals at Karlstad University and Stockholm University. Ulf P. Lundgren is Professor Emeritus at Uppsala University. He has held a professor’s chair at Aalborg University, Denmark, and at the Insitute of Education, Stockholm University, where he also been Vice Chancellor. He is a board member of the Mid Sweden University, the University of Gothenburg and the Faculty of Educational Sciences, Oslo University. Lundgren has worked extensively establishing bridges between the fields of educational science and educational policy-making as the Director General for the the National Agency for Education and as the General Secretary for the Swedish Research Council. Additionally, Lundgren has been commissioned for the committee for the National Curriculum; the Committee on a National Curriculum for pre-school Education and Compulsory Schooling; the Parliamentary Committee on the Education Act and a new legal system for education in Sweden. He has also played a major role internationally as the chairman for CERI/OECD, expert for OECD, the World Bank and the Education ministries of France, Norway, Sweden, and Portugal. He is currently involved in research in the fields of curriculum theory, evaluation, educational history and educational policy. Andreas Nordin is senior lecturer in education at Linnaeus University in Växjö, Sweden. His main research interest and publications are in the area of transnational and national educational policy and how these arenas relate to each other. In particular he analyses educational governance in the European Union in relation to educational reforms in Sweden. He is currently involved in a research project entitled ‘Who Has Governed the Swedish School? Municipality, School and State during 60 Years of Swedish School Reforms in a World of Change’ funded by the Swedish Research Council. It is a comparative analysis of municipal school policy in Sweden during1950 2010 focusing on the balance between national and municipal governing within municipal school policy and on the municipal variation in making school policy. Daniel Pettersson is a senior lecturer in Education at the University of Gävle, Sweden. Pettersson specialises in the history, dissemination and use of international large-scale assessments, in policy narratives and in the history of education. He is currently involved in the project Review of Comparative Research on Educational Performances (RECOMPED) financed by the Swedish Research Council, is a member of the research group STEP, Studies in Educational Policy and Educational Philosophy, at Uppsala University and a member of the editorial board of the Nordic Journal of Studies in educational Policy. Henrik Román is a PhD researcher and a senior lecturer at the Department of Education, Uppsala University. His main research interests are education policy and curriculum studies, generally from a historical perspective. His PhD thesis in 2006 was an analysis of how the huge transformation of the Swedish school system in the 1960s and 1970s affected the Swedish subject. Román has since then taken part in a comparative and historical project on assessment cultures in Sweden and Germany, and has produced a series of historical studies on municipal school policy. Since 2014 Román has headed the three year-project ‘Who Has Governed the Swedish School?’ In this project, which is financed by the Swedish Research Council, Román and his three fellow researchers will compare municipal school policy actions in four diverse Swedish municipalities from 1950 until the present time. Kirsten Sivesind is an associate professor in the Department of Teacher Education and School Research, University of Oslo, Norway. Her published work includes ‘Mixed Images and Merging Semantics in European Curricula’, Journal of Curriculum Studies, 1(2013); ‘The European Curriculum: restructuring and renewal’, a Special Issue (edited by Sivesind together with Moritz Rosenmund and Jan van der Akker), European Educational Research Journal, 3(2012); and (with Berit Karseth) ‘Conceptualising Curriculum Knowledge within and beyond the National Context’, European Journal of Education, 45(1), 2010. Daniel Sundberg is Associate Professor at the Department of Educational Science, Linnaeus University, Sweden. His research interests include comparative and historical perspectives on curriculum, schooling and society. Sundberg is chairing the research network ERECKS (Educational Reforms and Educational Knowledge in Europe) financed by the Swedish Research Council and is a member of several national and international commissions. Recent publications deal with curriculum theory and policy making in terms of understanding and explaining curriculum making in the complex interconnection of transnational and national contexts and its endogenous as well as exogenous forces and determinants. Ninni Wahlström is Professor of Education at Linnæus University in Sweden. Her research interests are curriculum theory, with a broad interpretation of the concept which includes an interest in educational policy, pedagogy and educational philosophy. Currently, she leads a research project involving a theory-based evaluation of the Swedish curriculum for compulsory school, where the three arenas, the institutional, the programmatic, and the classroom arena, are analysed.